hobbyguy wrote: About 10 times more than the previous government. 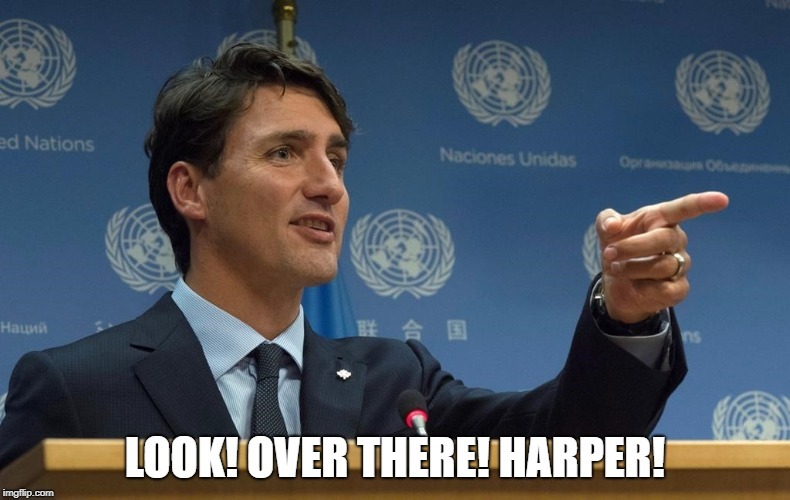 It was obvious that the "Harper/Oliver nasty" approach was going to fail and it did. Like much of the nonsense "tough on crime" stuff that the Conservatives peddled - and then it got stuck down in the courts (the last one in December as I recall). All the COnservatives did was stir up a great big hornet's nest with their know nothing "my way or the highway" antics. Now we have FNs that want to buy the pipeline, not fight it. We are down to two minor issues and a real solution for Alberta - a tidewater pipeline, will be built. BOTH of those two hurdles were created by the high handed and know nothing CONservatives. As usual, the Liberals are fixing all the problems that CONservatives created with their know nothing "this quarter" excuse for thinking. The CONservatives in government displayed as much prudence as the young woman in the article I posted who got herself into financial trouble by NOT asking the simple question: "and then what?". The Harper CONservative short term thinking gave us longer mortgages, (which they rolled back when they saw the US real estate market implode), super low interest rates for far too long, deficits, and unnecessary and stupid tax cuts (which is the root cause of the deficits we see today). You can't fix such bungling incompetence overnight. But it is being fixed, as with all repairs, one step at a time and in the necessary order. It is just like the young woman in Australia that built a mountain of debt - it takes much longer to dig out of that foolishness than to create it. Ah yes, Trudeau's massive tax increases and policies that make investment flee the country are indeed the fault of someone else. Just a note, peanut chuckers - that constant deflection of blame ain't gonna get Hair'n'Sox re-elected. 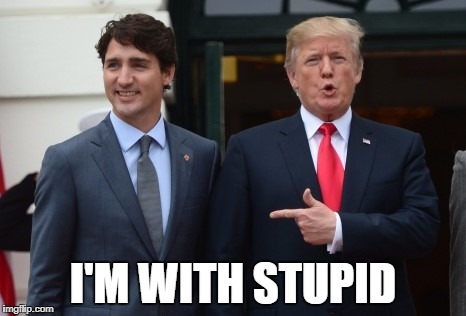 Canadians have had enough of Trudeau's bullcrap. Pete Podoski wrote: Sounds like the typical victim shaming we've come to expect from the left wing peanut chuckers on this forum. She got raped? Well, she deserved it because she wore those pants, and she obviously experienced the interaction differently from the guy who raped her, who can't recall any negative interactions that day. You have to borrow to pay for groceries? Well, it's your fault you learned a trade only to lose your job when Trudeau cancelled the pipeline construction and slapped regulatory and tax burdens on the company you worked for. Being responsible for one's finance and being called on it......is " victim shaming"? Boy if that's true, we must be in a parallel bizzaro world. This isn't for most peeps about borrowing money for food. It's about that second vacay in 6 months, buying a brand new Mercedes when you already have two cars or buying clothes that just sit in your closet or a boat or etc etc. It's about being in control of your finances, being disiplined and not giving in to one's impulses. Sadly, there are too many people that don't know how to do that and hence the topic of this thread. Gone_Fishin wrote: Ah yes, Trudeau's massive tax increases and policies that make investment flee the country are indeed the fault of someone else. "Canadians Now Paying Lower Income Taxes Than Americans, OECD Data Shows"
"The OECD's study, "Taxing Wages 2018," found that the employee net average tax rate for a single person in Canada with no children was 22.8 per cent in 2017, the 11th lowest among 35 OECD countries. The U.S. clocked in at 26.1 per cent. The OECD's estimates take into account federal and provincial or state taxes, as well as social security contributions and money returned in the form of family benefits." The answer to my question is, of course, that all the CONservatives have are fibs and "Harper nasty" to fall back on. So no, high taxes do NOT play into the penchant by a significant number of Canadians to build themselves mountains of debt. It is consumer imprudence that puts some Canadians behind the 8 ball and paycheck to paycheck living. I just calculated my income taxes, I make an average salary and was taxed 26% total, no children. On top of my income tax, I pay property tax, carbon tax, gas tax, liquor tax, licence fees, hunting fees, fishing fees, dog fees, you name it. I've toyed with a huge calculation to sum up all taxes and have arrived between 45% - 52% of my wage going to the government in some form. ^^ wages in BC are above the national average, so yup, you could easily be paying above average. Most of those are the user pay tax variety , no? Don't play so much and you won't have to pay so much . Besides if your complaining about tax and if we didn't have the inadequate number of immigrants we have now, you'd be paying a lot more tax for less service.....think about that next time you're complaining about immigration. In years past, there used to be about 17 workers to support the elder population. Now it's around 4 to 1, pretty soon it will be 2 to 1. I consider that a scary ratio. If you think your overtaxed now, wait until we hit the latter ratio. I don't see anywhere that Gone Fishin said Canadians' personal income taxes were lower or higher than Americans'. Certainly, business taxes are far lower in the states than here, though, and business is what drives our economy. But continue to post drivel that fails to refute what brighter people are saying, because it makes the peanut chucking camp look just as dim as their pretty boy leader. You're blaming the wrong guy for the disparity in US and Canadian corporate tax. Our federal corporate tax base is lower than the US federal rate, it's the Provincial corporate tax that puts us over the US. But yeah, go ahead and blame JT and the LIbs for any and everything, eventually you'll get one right, afterall even a broken clock is right twice a day . Pete - you need to study the Laffer curve and the discussions surrounding it. The correct amount of taxation necessary to optimize the economy is a key part of understanding what constitutes good taxation levels. Generally speaking, Canada is toward the lower end the optimization rate. We should probably be 1-2% higher in overall taxation to achieve the best results. At this point in time, and in context, that means higher taxes at the top end would be appropriate. Bear in mind that even a staunchly small c conservative like Winston Churchill recognized the value of income redistribution. I know hat is a swear phrase in some far right circles, but income redistribution has been proven to be a win-win, improving the prosperity (of which simplistic economics is only a part) of nations. I would agree that corporate taxation has become a thorny issue. We in western societies have a problem, in that the supply siders have created an economic oligarchy of corporations that largely ignores its responsibilities (yes - responsibilities) in maintaining the overall prosperity of nations. The closest analogy is the "Robber Baron" period of the late 1800s that Teddy Roosevelt started breaking up. Unfortunately, the supply siders defanged and destroyed the competition, monopoly and antitrust laws. That has created a "race to the bottom" on corporate taxation, and is at the heart of the huge income inequality problems that have developed. Everything the corporate oligarchs do is aimed at profit, and most everything "this quarter, next quarter" profit. To paraphrase Confucious: "if you do everything for profit, you will engender great resentment". It doesn't help that the corporate oligarchs have been really smooth and successful in tricking folks into thinking that "what is good for them, is good for the country". The notions out there like "what is good for GM is good for America" are simplistic and manipulatory. We see in microcosm the problem when we look at the Oshawa situation. GM, and their few wealthy oligarch major shareholders (note that the vast majority of the shares in any company that us peons can buy are non-voting shares) have more power than our government. "Delinquencies on Canadian lines of credit are tiny, but they tell an intriguing tale. There’s still “very little stress” on loans as interest rates rise, CIBC World Markets said in a new study, but insolvencies are rising, and that’s expected to continue as borrowing costs increase further." “At just 0.9 per cent, the delinquency rate in the credit cards portfolio is at a record low, after trending downward since the recession,” Mr. Tal said. “The same is true for term loans and mortgages,” he added. Insolvencies, Mr. Tal said, are rising at an annual pace of 4.5 per cent, the sharpest since mid-2016. There’s another interesting twist here, too, in the breakdown between outright consumer bankruptcies and what are known as proposals, where stretched borrowers negotiate new terms rather than simply going bust. Both are insolvencies. But while consumer bankruptcies have declined in the last year by a cumulative 5 per cent, proposals have climbed 8.4 per cent. Total insolvencies are still low, but you can see how the troubles in the oil market are taking a toll. “The cumulative number of insolvencies in Alberta rose by 12 per cent during the six months ending November, 2018, Manitoba and Saskatchewan have seen roughly the same increase,” Mr. Tal said. “At the same time, the number of insolvencies in Ontario rose by close to 3 per cent. The same is true for B.C.”"
So the picture belies the OP headline. Actual bankruptcies are down, and it appears the banks are helping folks out (in their own interest as well) to restructure debt loads and render them solvent again. Plus bear in mind that the total percentage of folks "in real trouble" is still very low. That said, the original 46% number remains cautionary. It does show that the extraordinarily low interest rates we had for far too long have created some significant froth in lending markets. Mind you, as CTV pointed out in their broadcast it is not terribly onerous for many to cut as much as $500 per month out of their spending. floppi wrote: This is so there is enough in CPP when you retire and maybe get a raise.....it's all good, no? Perhaps. The sad thing about investments is that they are usually at their least valuable just when they are needed the most. It doesn’t take much selling pressure to cause a general collapse in the markets. As long its investments continue to do well, the CPP will be fine. What will happen to the CPP when, not if, we enter a protracted bear market in virtually all sectors of the economy is not going to be a pretty picture. That is when deficit spending is called for, but like an overused antibiotic, that recourse grows less effective as governments use it as an alternative to making responsible spending choices. So far, there has been little discussion about the possibility that the government’s interest in Canadians’ private banking info is a precursor to means testing for entitlement programs like health care and OAS. The need for such measures might come sooner than we imagine. ^^ the government already income tests for OAS and GIS. They don't need banking info. Plus for most of what most folks have in retirement savings it goes into registered accounts, RRSP, RIF, LIF, TFSA etc. and so they have the figures already if needed. The argument you make about CPP investments going futz just when needed has been made for 60 or more years - and it hasn't happened yet. Doesn't mean it couldn't, but because CPP is structured payout over time, the risk is almost zero. Most CPP is drawn out over a period of about 17-20 years - IF there was a major "futz" that lasted that long, we would all be freezing and starving in the dark. Yup, you could have 1-3 years of down time within that 17-20 years, but the resulting "up" would make up for it. After 08-09 investments made at that time just rocketed. So that tends to smooth CPP investments. floppi wrote: Most of those are the user pay tax variety , no? Don't play so much and you won't have to pay so much . Besides if your complaining about tax and if we didn't have the inadequate number of immigrants we have now, you'd be paying a lot more tax for less service.....think about that next time you're complaining about immigration. In years past, there used to be about 17 workers to support the elder population. Now it's around 4 to 1, pretty soon it will be 2 to 1. I consider that a scary ratio. If you think your overtaxed now, wait until we hit the latter ratio. Yeah...too bad robots don't pay into the CPP and OAS or we would be good.